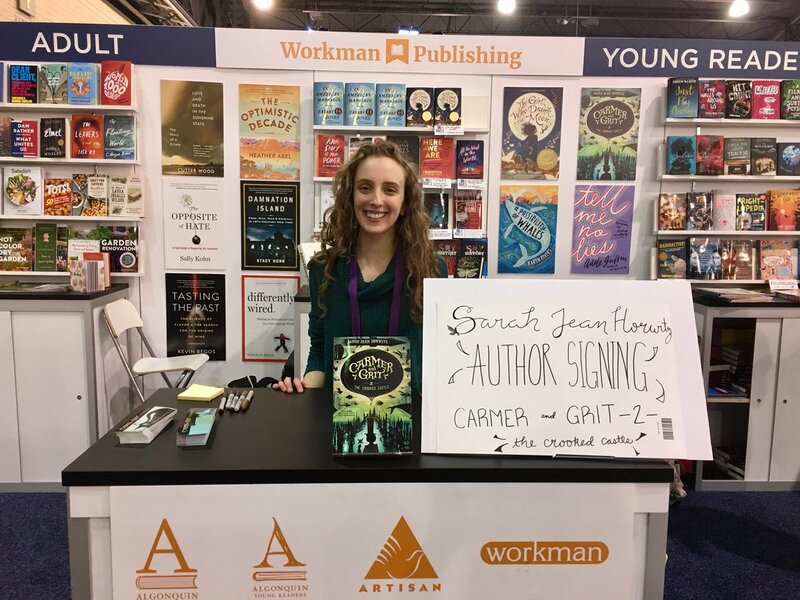 Today’s post is a guest post about the process of character creation, written by the very lovely and talented author, Sarah Jean Horwitz. Sarah writes the Carmer and Grit series, which rocketed up my all-time favorites list early last year. I am incredibly honored to have this chance to feature her on my blog and to work with her to promote her wonderful books! Please make sure to check out Sarah on her website, Twitter, Instagram, and Goodreads. The Carmer and Grit series consists of The Wingsnatchers and The Crooked Castle. The Crooked Castle, my second book in the Carmer and Grit series, begins with something very large crashing into Carmer’s roof. Well, not something, exactly – someone. When seventeen year-old balloonist Bell Daisimer loses control of his balloon and literally crashes into the lives of Carmer and Grit, he starts a chain of events that leads them to a magical flying circus, a brand new mystery, and a whole lot of scary faeries. An aspiring pilot always game for an adventure, Bell helps Carmer and Grit navigate the aeronautical community they suddenly find themselves immersed in. The story couldn’t exist without him. But Bell Daisimer was not always a balloonist. In fact, the Bell Daisimer that exists on the pages of The Crooked Castle is nothing like the character I originally imagined – and that’s what so great about him, and about writing stories in general. Back in the early days of brainstorming for the book, Bell was one of the first characters I knew I wanted to add. The first book’s villain ran a number of enterprises, including a scientific school for boys. With the villain’s defeat came the unraveling of many of his businesses. Bell had little connection to said villain, but he was a scholarship student at that school. Bell lost his scholarship in the fallout, and at the start of the second book, he was determined to find out the real reason behind his benefactor’s meteoric rise and fall. Bell was supposed to spend the book as the thorn in Carmer’s side, always sticking his nose where it didn’t belong, eagerly searching for evidence of faerie magic. Much of the book’s plot at that time revolved around telephone and radio technology, so Bell was named after – you guessed it – Alexander Graham Bell. If you’ve read The Crooked Castle – or even taken a casual glance at the jacket! – you’ll know that there’s nary a mention of telephones, radios, or dissolved educational institutions. But Bell Daisimer somehow managed to make it through every iteration of the story, evolving and changing until he became the character on the page today. This character evolution was a new experience for me. Most of the characters in The Wingsnatchers simply popped into my head, fully formed and ready to be written. Carmer, Grit, the Amazifier, Kitty, Gideon Sharpe, Madame Euphemia – even minor characters like Echolaken and Ravene – they all simply appeared in my mind’s eye, walking and talking almost exactly as they do in the finished draft. I was extremely lucky to have such a great cast of characters pop out of nowhere, ready and waiting to be written about. While writing The Crooked Castle, however, fewer characters appeared to me as fully formed. Many, like Bell, started out as mere seedlings of ideas. Perhaps I knew one or two of their distinguishing features, or how I wanted them to function in the story. I definitely had to work for them, teasing out their voices through lots of brainstorming, reading aloud, and revisions. Sometimes, stories and characters come easily, like a garden that flowers all at once, filled with vivid and healthy and complementary plants. Maybe they need a bit of rearranging or a bit more sun here and there, but otherwise, they’re complete. Other times, you’ve got to stare at your plot of dirt for a bit, plant a few seeds, and coax them into something beautiful yourself. You’ve got to go in pruning and weeding and watering and getting your hands dirty. Both processes have their pleasures – and at the end, you’ve still got a garden. The trick in storytelling, of course, is to make the finished story smooth enough that no one can tell how you grew it! I hope you and your readers enjoy meeting Bell and the new cast of The Crooked Castle. Though this book was a challenge for me, I do hope to write more Carmer and Grit stories in the future. I can’t wait to see how my garden will grow with each one. The Crooked Castle will be out on April 10th! And of course, make sure to check out The Wingsnatchers as well! My review of The Crooked Castle will be up in a few days, and if you would like to read my review of The Wingsnatchers, click the teacup below!